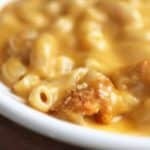 If you like a slightly less cheesy gluten-free macaroni and cheese, reduce the cheese from 12 ounces (total) to 8 ounces (total). Feel free to do this as you please, reducing either the Cheddar, the Colby, or both! Adjust oven rack to middle position and preheat oven to 375°F. Fill a medium (3 quart) pot 3/4 full with water. Cover and bring to a boil over high heat. When water reaches a boil, add one teaspoon salt and pasta. Stir frequently with a wooden spoon during the first few minutes of cooking. Set a colander in the sink drain the pasta. Switch to a wire whisk. Add sweet rice flour. Cook, whisking constantly, until thick and light brown, about three minutes. In a slow and steady steam, add chicken broth and milk. Whisk until mixture thickens. Cook until mixture is thick and beings to bubble. Add cheese, one handful at a time, until incorporated. Stir gently using a wooden spoon until cheese melts. Sauce should be smooth. Reduce heat to low. Check pasta. When it’s almost tender, drain and return to cooking pot. Add pasta to sauce. Stir to combine. Pour into an 8x8-inch baking pan. Sprinkle breadcrumbs and Parmesan cheese evenly over the top of pasta. Bake until sauce is bubbling and edges are starting to turn golden brown, about or 25-30 minutes. Remove pan from oven and allow to cool for ten minutes before serving.